Hi Everyone, the Birthday Blooms stamp set is still one of my favourite in the current 2016-2017 Annual Catalogue. I have made a LOT of cards using this stamp set. 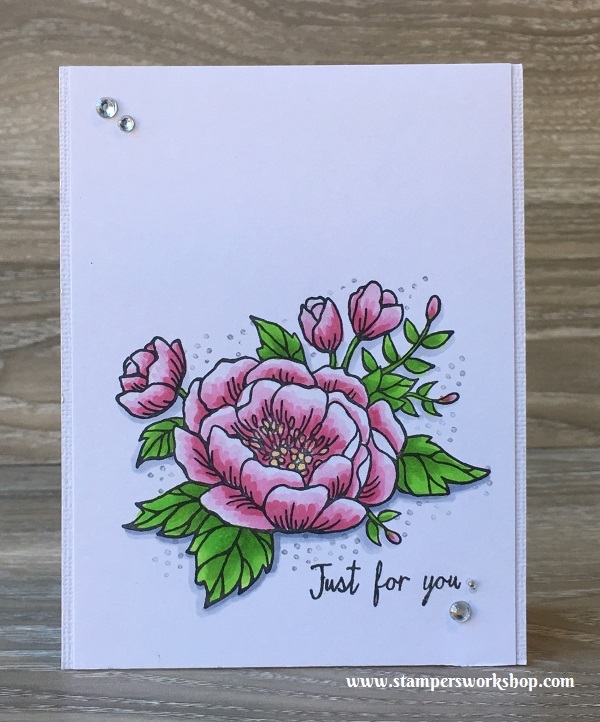 I have posted some of my card designs in earlier posts but there are a lot more which are just variations of the same design. I’ve decided to share them all over the next few posts as I think they go a long way to showing how just a different sentiment stamp or a change in the colours used, creates variety. Don’t forget that we end up sending the cards to different people so it doesn’t matter how similar, or different, they are. Just do what you love! 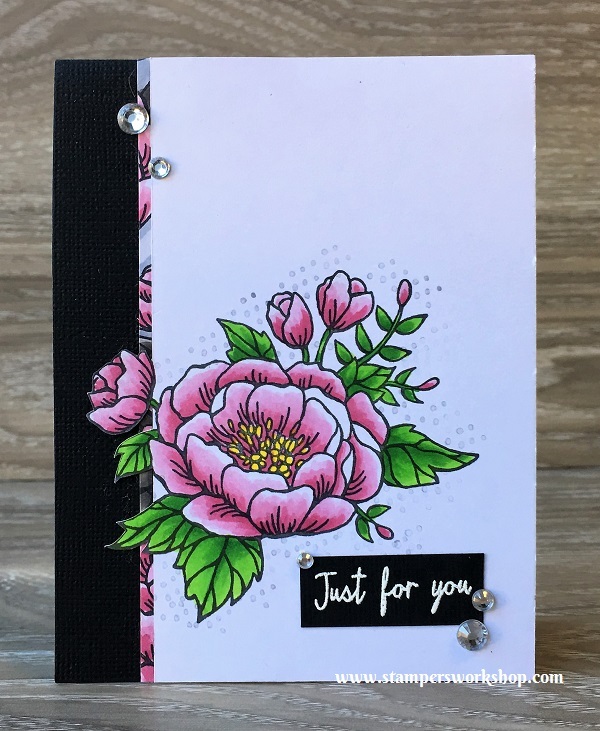 Materials used: Stamps – Birthday Blooms (140658), Watercolor Wings (139424); Cardstock – Knights Smooth, American Crafts; Memento Black Ink, Smoky Slate Classic Stampin’ Pad; Wink of Stella: Clear; Rhinestones and Copic Markers. 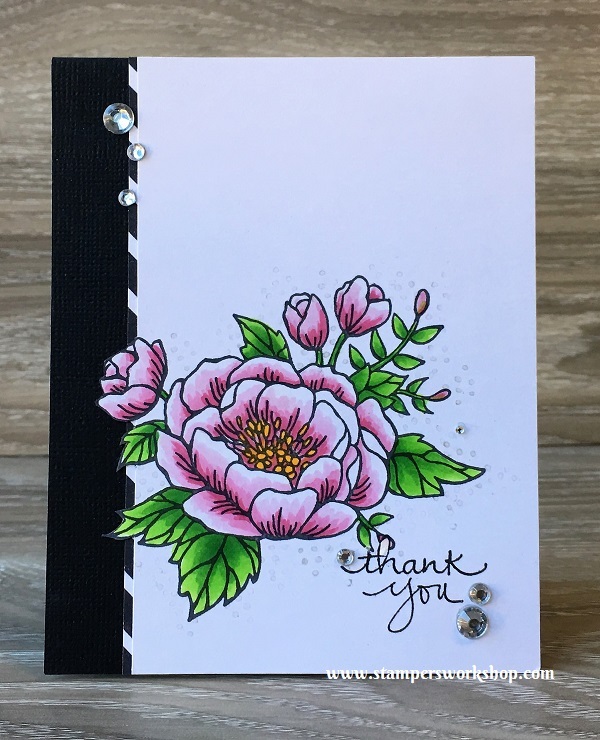 Materials used: Stamps – Birthday Blooms (140658), Endless Thanks (138796), Diagonal Stripe (141917); Cardstock – Knights Smooth, American Crafts; Memento Black Ink, Smoky Slate Classic Stampin’ Pad; Wink of Stella: Clear; Rhinestones and Copic Markers. Materials used: Stamps – Birthday Blooms (140658), Watercolor Wings (139424); Cardstock – Knights Smooth, American Crafts; Memento Black Ink, Smoky Slate Classic Stampin’ Pad, Whisper White Craft Ink; White Embossing Powder; Wink of Stella: Clear; Rhinestones and Copic Markers. I hope the above cards have encouraged you to dig out your favourite stamp set and play. Vary a few features such as the colour or sentiment and just see where you end up. Don’t forget to check out the Retiring List today as it might be the last chance you get to grab one of your favourites in the current catalogue. Some items are selling out fast!